Lemonpeel angelfish larvae (Centropyge flavissima) were raised from captive-spawned eggs at 77-79F on wild copepods and artemia. The larval duration was 70 days. First record of Lemonpeel angelfish culture. 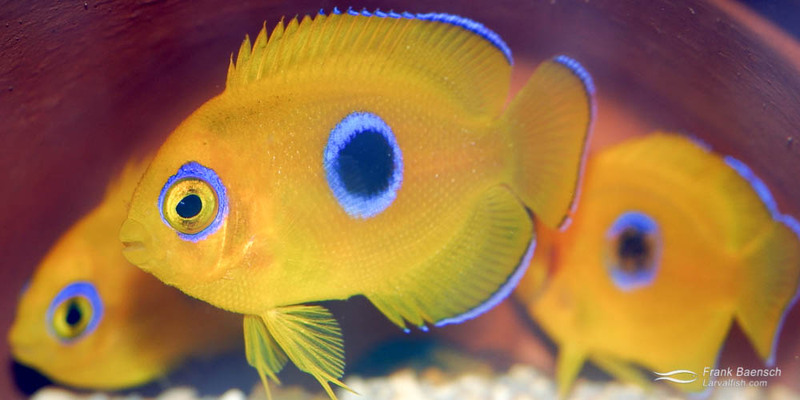 Hardy and less aggressive than most other pygmy angelfishes, the Lemonpeel angelfish ranks among the most heavily traded marine angelfishes. It thrives on a diet rich in algae. This species is widely distributed and is common throughout most of Melanasia and Micronesia. It prefers water temperature between 77 and 82F. Adults reach a maximum size of 5 inches. Left: A pair of Lemonpeel Angelfish (male on left). Right: 80-day-old Lemonpeel Angelfish juveniles in hiding. Captive-bred juveniles loose their blue dot after just three weeks. Juveniles in the wild keep it much longer. A harem of three Lemonpeel Angelfish spawned at my facility for over 5 years.